The economic crisis certainly is the foremost “problem” for citizens of world leading Countries analysed in the Greendex survey National Geographic conducted in partnership with GlobeScan(1). Ranking in second and third place are concerns that in certain ways derive from the first: political turmoil and unemployment; it is interesting to note that these issues claimed first place in Countries such as France, Germany, Brazil and Spain. Environmental issues ranked fifth in this complex scenario, a significant rise compared to the survey conducted in 2008. 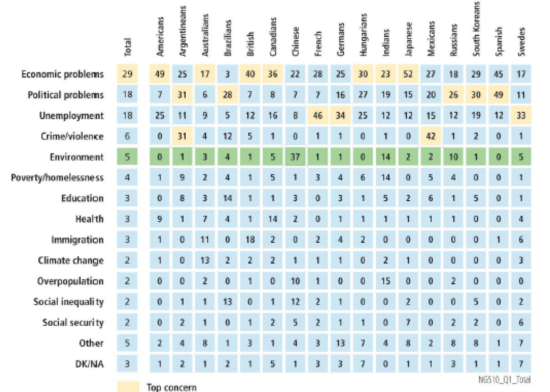 The table above nonetheless shows that consumers in industrialized Countries tend to be less concerned about global environmental issues than those in the so-called BRIC Countries, namely: Brazil, Russia, India and China. Two-thirds of consumers around the world, according to Nielsen(2), would rather buy products and services from companies that implement programs to support the environment. 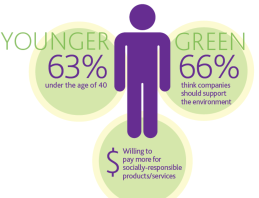 “Socially conscious consumers” tend to be younger (63% are under 40 years of age). Almost half (46%) of them say they are willing to pay a little bit more for socially responsible products and services. Euromonitor(3) recorded important regional differences in the social consciousness of consumers. In North America and Europe consumers are seemingly less willing to pay a higher price than those in Latin America, the Middle-East/Africa and Asia-Pacific. 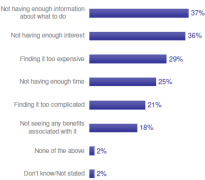 Citizens certainly want to see the companies to address the most urgent problem: economic development. Next, they want companies to be more environmentally responsible. 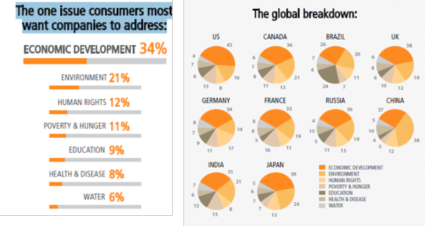 Consumers world-wide want to buy socially responsible products. The vast majority (94%), given the chance, would rather buy a product tied to a “good cause”(4). 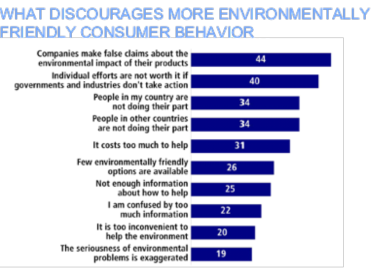 National Geographic Greendex survey study asked consumers in 17 Countries to name 10 factors that discourage them from undertaking a more environmentally friendly behaviour(5): the highest percentage (44%) said it is the false claims some companies make about the environmental impact of their products. One of the most promising markets, with growth rates among the highest in the global consumer market and a very wide-range of product offerings. 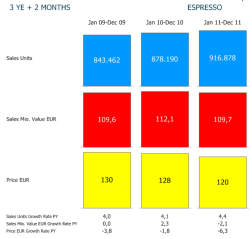 An incredible evolution, that of the portioned coffee market, one that started in 2002/2003 and continues to undergo effervescent growth and transformation: the traditional offer of a “simple” raw material/commodity (whole or ground beans) became a consumer product/service (coffee ready to serve in the cup). A transformation validated by the latest consumer trends and the explosive dynamics of a wide variety of open – semi-open – closed and multi-beverage system offerings. Plastic and aluminium characterize the so-called closed systems, while paper is predominant in open systems, which give consumers true freedom of choice. All of these systems still hold immense potential for growth. 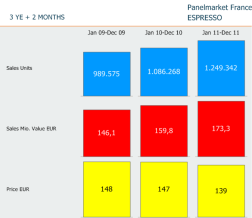 The solutions launched on the portioned coffee market, supported by suitable distribution and information, scored premium prices and the immediate approval of consumers, whose loyalty could be ensured through long term subscriptions and accessories. We are witnessing a phenomenon that is not an evolution, it is a revolution that responds to the needs of the consumer. The key lies in giving anyone (expert or not) the opportunity to make themselves a good cup of coffee in a way that is simple, clean, efficient and in the case of paper pods, also eco-friendly. Gone are the days when only a few, elite connoisseurs could make good coffee at home (with coffee grinder, machine and accessories taking up a lot of kitchen space); today espresso (and other things) can be made easily and cleanly (since it is pre-measured and packed) in a minimal amount of space and readily enjoyed at home, at the office, at restaurants, on airplanes and so on. This also includes all places where the amount of coffee to be made could not possibly justify (or allow) using “professional” equipment. A little more than ten years ago this was made possible by a “system” (machine+coffee serving) that delivers excellent coffee right into the cup of the consumer time after time, regardless of daily consumption habits or … expertise. In full respect of the best coffee preparation traditions (most clearly demonstrated by the paper pod), certain variables that are important to yield a beverage of good quality (grind size; tamping pressure; water temperature; flow speed etc.) have been resolved uphill, to replicate the “touch” of a professional barista out of a true and proper coffee bar. 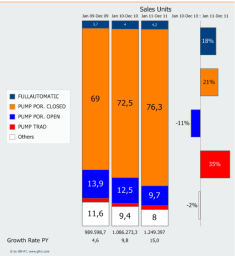 Until five years ago, a few operators who only offered “closed systems: dominated this market: the same company sold coffee and machines, which worked exclusively with each other. This effectively obligated the customer to use products made by that company. Today the situation is vastly different also because these options are now flanked by “semi-open” and completely open systems (like machines and pods that bear the E.S.E. mark). This means that today the consumer can freely choose and use different combinations of brand name coffee and machines. The Consortium E.S.E. felt it was important to provide the single-servings coffee market with guidelines by which to start defining its basis and systems. It is an increasingly sophisticated technological combination of coffee machines and a capsules or paper pod coffee portioning system. What does this system offer? Service and quality. It directly fulfils the demand of consumers, who find the service answers their need for simplicity as well as providing the quality guaranteed by an experienced barista thanks to the careful calibration of both espresso machines and coffee servings, which ensures the product and service delivered by the system do in fact satisfy the end consumer. The market currently offers open systems and closed system. Open System. Allows different brands of coffee and machines to be used interchangeably, thanks to a predefined standard. The consumer may choose whichever machine and coffee combination he prefers, since manufacturers abide by a standard that allows the industry to create, plan and operate more interactively with the market. The only open system currently on the market is in fact the standard E.S.E. Semi-open system. Small associations with few member companies; technically it is an open system, but not registered as such. Closed system. Also defined as being a proprietary system. It is a system protected by patents both on the machine and the pod. The consumer who chooses it can only use it by purchasing that specific brand and type of coffee. There are numerous examples of companies that launched proprietary systems of their own and control them directly, although their approach to the market may differ. Pods are made of paper, capsules of aluminium or plastic. Paper pods can further be devided into: compact pods, which deliver traditional espresso and soft pods that yield a beverage more akin to the European filter and coffee culture and which, in Italy, is known as “long”. Ho.Re.Ca., offices and families. Every company has either focused on a few segments of the market or has tried to establish a presence in all of them. Another line of demarcation is drawn between espresso and long coffee. Italian consumers can easily tell the difference, but not European consumers in general. Each system to a lesser or greater extent lies on either side of this demarcation line. Multi-beverage systems make not only coffee, but other beverages as well. Offices have used them for many years, and now they are also available for home use. Systems that offer greater versatility in terms of making espresso and long coffee. These systems allow consumers to make both versions with the same machine. These markets require large investments, and new products are being launched at an extremely rapid pace. Numerous new players are trying to gain market shares from different starting positions. A critical factor for everyone’s success lies in offering consumers an integrated system. Gli operatori si stanno facendo carico di tutta la chiarezza necessaria come categoria, come sistema, come industria perché il consumatore possa apprezzare tutto quanto stanno facendo all’interno di questo mercato? Si può partire da due presupposti: in sistemi complessi, i comportamenti cooperativi pagano di più dei comportamenti competitivi; questo non significa negare i comportamenti competitivi, ma piuttosto che nei sistemi complessi è bene che si metta insieme un po’ di cooperazione con tanta competitività per ottenere buoni risultati. In questo tipo di mercato, ci sono delle dinamiche precompetitive che possono indirizzare il consumatore meglio che in una situazione totalmente competitiva e si può concorrere nel trovare un linguaggio comune che il consumatore possa capire e valorizzare. Questo ovvierebbe al rischio che i consumatori rinviino le decisioni di acquisto data l’eccessiva confusione dell’offerta. La cooperazione implica una grande attenzione nei confronti del consumatore, che è attualmente un butterfly consumer. Nel caso in cui non si riesca a fare chiarezza nel settore, il rischio maggiore è quello che i consumatori tendano a favorire sempre e comunque i new comers, a causa della scarsa chiarezza informativa. Nel nuovo scenario di iper-competitività dei mercati, il meccanismo di guida maggiormente riconosciuto è il processo di convergenza che dirige la traiettoria evolutiva di molte realtà industriali. Molte società, per essere all’altezza del mercato e della complessa gamma di esigenze, dovrebbero integrare capacità asimmetriche di altre società, o di altri concorrenti. La sfida delle coevoluzione non è solo una nuova terminologia, ma una nuova modalità concorrenziale.